Whether in Summerlin, Southern Highlands or Centennial Hills, guests can travel back in time with three totally tubular ’80s parties at Distill Summerlin (10820 W. Charleston Blvd. ), Distill Southern Highlands (4830 W. Pyle Ave.) and Distill Centennial Hills (6430 N. Durango Rd.). 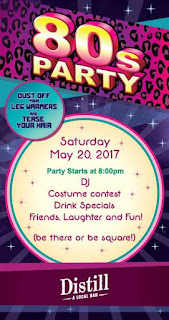 On Saturday, May 20 beginning at 8 p.m. guests can put on their printed legwarmers, tease their hair and tight roll their jeans for either (or all) parties. There is no cover, however all guests must be over 21 years-old with valid ID. A DJ will be spinning all the favorite ’80s hits throughout the night including hair metal, boy bands, new wave and more. All guests are encouraged to grab their red, green, yellow or blue scrunchie or channel their inner brain, athlete, princess, basket case and criminal to participate in the costume contest. Paying homage to the decade, drink specials will include $3 Bartles and James, $2 Jello Shots and $3 Miller Light bottles. Along with unique and fun themed parties throughout the year, Distill boasts a wide selection of house-made cocktails and handcrafted food. Distill also offers a VIP Gaming Club, 24-hour service from their friendly staff, tasty lunch specials seven days a week and much more. From Summerlin to Henderson to Centennial Hills, Remedy’s, Elixir and Distill are Vegas locals’ ‘homes away from home.’ All locations feature fun and casual good times in beautiful and eclectic atmospheres with state-of-the-art gaming, handcrafted cocktails, house-made tavern fare, friendly staff, fun events, two daily happy hours and the ultimate home for sports action. All locations feature the RED Loyalty, a frequent dining program allowing guests to earn points at all RED properties for discounts and promotions. For a full list of events and information, please visit www.remedystavern, www.elixirlounge.net or www.distillbar.com.